Fudge is a type of sweet confectionery that was first made in England. It tends to be made out of sugar, butter and milk, and it sets into a crumbly and smooth texture. Fudge is generally very easily flavoured and you can make it in pretty much any flavour that you like, including chocolate, strawberry and liquor, recipes for which are listed below. Apple Crumble Recipe - Crumbles can be made with either fruit and sugar or there are also savoury versions. Brownie Recipes - Wonderful cross between cake and cookie, and incredibly easy to make. Chestnut Recipes - Chestnuts come into season during the winter months, meaning that they are commonly associated with Christmas. Flapjack Recipes - Flapjacks in the UK are made out of oats, syrup, brown sugar and butter. Gingerbread Recipes - A variety of ginger sweet treats, ranging from cakes to hard biscuits. Scone Recipes - Scones can be either lightly sweetened or served as a savoury bread with butter. Shortbread Recipe - Scottish shortbread originally comes from a biscuit made in medieval times. Fudge is very similar to toffee in flavour, except it can be made in a far shorter amount of time and it doesn't set quite as hard – you certainly don't need a hammer to be able to eat it! 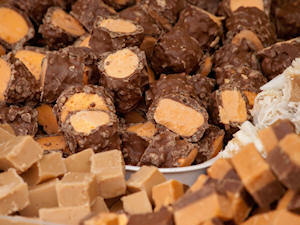 There are a variety of ways of making fudge – the most traditional way of making fudge involves mixing the ingredients together in a saucepan, but more time-saving ways of making fudge involve using time-saving ingredients, like condensed milk or icing sugar, or making the fudge in a microwave. For some delicious fudge recipes, take a look at the list above. All of the recipes that contain chocolate call for the use of chocolate drops, but that is simply to make the recipe easier – if you don't have chocolate drops, just roughly chop the same weight of chocolate that is listed in the recipe. FudgeRecipes.co.uk uses measurements and ingredients for the United Kingdom. If you are located elsewhere in the world, you may find FudgeRecipes.org makes more sense to you!